Yep- I joined Secret Pal 7. (See the new button? Look right!) This should be fun. I already have contacted My SP and I am excited to get going! Here is my questionnaire- read at your own risk! I usually buy natural fibers. I think some acrylic blends are great, especially for kid knitting. Some superwash yarns make me nuts with the squeaking and the feel. Red Heart no, Lion Brand – from time to time. I do love cashmere, alpaca, wool and would love to knit with quiviut. Nope. I want to learn to spin though. I tried when I was pregnant with boy #1 and I think that my Bump threw my balance off. It was a disaster. It might be good to learn to crochet for edgings and the like. A vase, a pasta tin, a lantern moon needle roll and a hook on the wall. Oh and a giant pile on the side table. I have been knitting almost all of all my life, since I was about 10. I would consider myself advanced intermediate. I can do/ have done: intarsia, fair isle, hats, sweaters, cables, lace, and blankets. I guess what I haven’t done is socks and gloves/mittens. There is SO much more to learn, mainly in the technique department. And I want to improve my finishing. I would love to get my Master Knitting certification. There are so many details that I want to know how to do. Fresh cut grass, autumn. vanilla, apple. Heavily perfumed things make me nutty. I can barely go down the laundry aisle in the supermarket. I don’t really have a sweet tooth. If I do eat candy, I like toffee, caramel, sweet tarts and some sour candy. In the realm of snacks I love love love Tim’s Cascade Salt & Vinegar Chips! I quilt, sew, dye yarn, collage, paint, make sculpture, bake & decorate cookies, and I love to cook. I want to learn Indian and Middle Eastern cooking. I also garden organically and try to grow only heirloom veggies. Surprise me! I have room for just about everything. I would love to hear something I have never heard before. We have a pretty extensive music collection. The Johnny Cash, Elvis Costello, Aretha and Tom Waits are mine. So is the Soul 2 Soul. The Clash and Mississippi John Hurt are mine too. I listen to AfroPop World Wide on NPR every weekend. I will say that the Loverboy in our collection is my husband’s. The Weird Al is too! And yes, I can do the MP3 thing. I love color. This sounds hokey, but I think every color has a place. Well, maybe neon only for traffic signs. Looking at my stash I see earth tones, jewel tones, black, a few pastels. The colors that I knit with for myself most often are pumpkin orange (hate peach), many shades of green though not Hunter or Mint. Some of the latest colors I have knit for myself are Pastaza Birch, Rowan Goblin and Rowan Punch. Also, I love red- Brown Sheep Lamb’s Pride Blue Blood Red is a fave. I truly am not a fan of variegated yarn. If it is variegated with very similar colors-I can deal but otherwise, no thank you! Okay, Granny Apple Green and Pumpkin are true faves. And Teal, Bright Pink, and variegated No Thank You! One husband, 2 sons aged 5 and almost 3, one black Labrador named Earl and 2 kittens, Frog and Tink. Scarves and hats, yes! Mittens occasionally. Ponchos? Well, let’s just say there are 2 types of people in the world: Those who wear ponchos and those who don’t. Not so much with the ponchos. Like not at all. 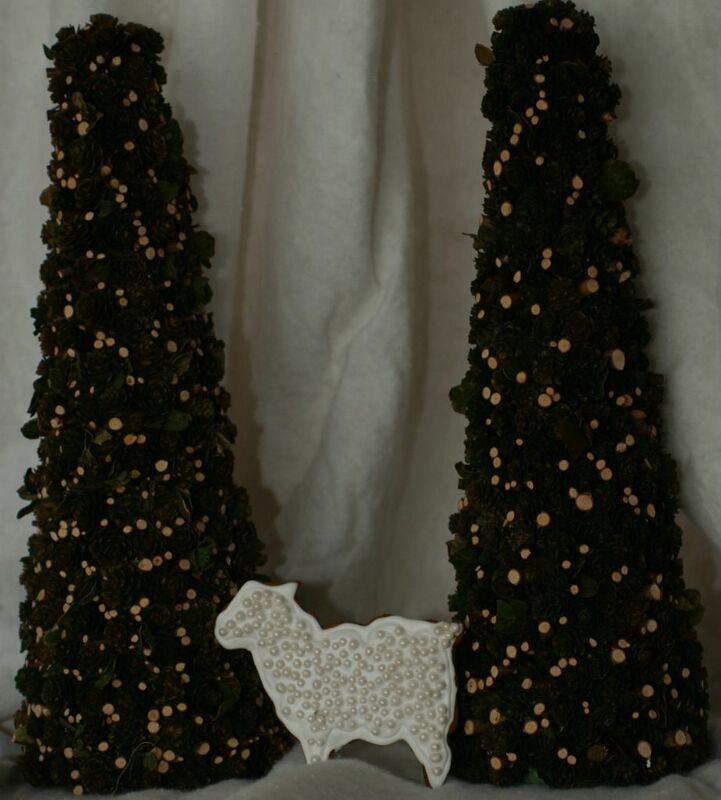 Rowan Magpie, Cascade 220, Brownsheep Lamb’s Pride. I also have in my stash some hand dyed Alpaca Fina that knits beautifully on #4′s. I am not fond of knitting with big needles- anything over a 9. Really big needles make my hands hurt. Size does matter. Also, I would love to try more yarns from small companies that are beginning to establish themselves. I love shopping at a Mom & Pop as opposed to a Barnes & Noble (though I shop there too)! Matchmaker DK by Jaeger. Anything that has that silk smell. I am the crazy one in the corner of my LYS sniffing silk yarn to see if it has *that smell*. And squeaky 100% acrylic or super wash yarns. More time knitting! My obsession currently is making a blanket/afghan. I cannot decide if I want to make it from squares, a sampler, or cabled. I want to make felted rugs for the living room. And I love the idea of knitting slipcovers for my furniture though that will most likely not happen! I love to knit it all. If I had to pick a stitch or motif, I particularly enjoy diamond shapes, whether it be argyle or a simple knit & purl diamond all over pattern. An Argyle vest from A Close Knit Family for the hubbalicious, Billy Boy Waist Coat from Rowan #22 in Denim-Nashville and I am about to cast on a cardigan for my dear Auntie Alice out of Debbie Bliss Cashmere Cotton. I am using Ann Budd’s Handy Book of Sweater Patterns as my guide. I think I may knit it in the round using steeks. Seems to be quicker that way. Plus cutting knitting is so damned liberating! Yes! But crocheted Christmas Angels are right out! I like them all. My favorite needles are vintage Susan Bates Circlon. They are seriously wonderful. And I am more fond of the straight circs. I find the angled ones a pain. From my Grandmother and my mother. Up until last Friday, my oldest UFO was 13 years old. (Frog Pond!) Currently, my oldest UFO is 9 or 10 years old. Oh, crikey! I like Hello Kitty – yes I am eight! I also like all the Audubon drawings. We are learing to love our Blue Birds and Cardinals that come to our feeder. Probably Halloween. Valentines is a close second. Well, there was the Pez collection and the lint collection (don’t ask), and the broken safety glass collection. But now it is cookie cutters, novelty salt & pepper shakers, cook books, and vintage knitting patterns. Oh and Rowan Magpie! Why, oh why did they discontinue it? I know why and it makes me mad. IK, though I had VK and Knitters for a long time- I grew to not like them as much as IK. More of each please! Barbara Walker really appeals and I have none of her stuff. There are also some items on my Amazon wish list. Also, I love Japanese knitting or quilting books and I have none! 29. Are there any new techniques you’d like to learn? Finishing (I am decent but would love to improve), short row shaping, socks and being able to do the arithmetic to design my own garments. I am going to knit my first pair of socks here pretty soon! And I have size 9b feet. I just got measured today and wow! Before the boys were born I wore an 8. Celtic Circles, A New Look. Thank you to everyone who commented on the Celtic Circles dilemma. I had thought that I would fashion it into a vest and gift it to a friend. I had planned on gifting to a particular friend who is a neighbor also and we see each other quite frequently. When I thought of seeing her in the Celtic Circles Vest, I realized that everytime I saw her in it, I would be reminded of what I did not finish. Then I would begin to resent her and then stop visiting, stop having our children play together and our husbands’ cribbage games would cease. Our friendship would deteriorate and then every time she drove by the house, I would have to say a curse and spit on the ground. Then a large dark rain cloud would form on our block, we live only a couple of doors away from each other, and we would be in a constant downpour. We would be so waterlogged and cold that we would become ill and of course, eventually perish. So, to prevent this horrible loss, I did the most practical thing I could. I frogged it. Really and truly, down to the last stitch. It began easily enough and I managed to get some very decent re-usable yarn out of it. Then the red yarn began to mate, yes mate with the other yarns. It became impossible to disentangle the three yarns. In truth, I could have made a pot of tea, sat in a comfy chair and undone the yards and yards of yarn. Could have and chose not to. Then I started hearing voices. I heard Margene say: “It is the process”. I heard Jane say: “This sweater’s time is past.” I heard my Mom say: “Oh, no all that hard work, gone!” I heard the multiple people in the past 13 years of the sweater’s life say: “You have come too far to frog it. You HAVE to finish it”. Then I thought of all the places that sweater had lived, crises it saw and what an huge albatross it had become. That is when the ripping began in earnest. And it felt really, really good. It amuses me to no end that I was not capable of just chucking it in the trash, but I was completely able to rip the ever-loving snot out of it. I do not really have any ideas as to what I might make with all the yarn. I did find a recipe for making felt pin cushions that involved hacking wool into little bits and putting them in a blender with boiling water. While it won’t give me good Karma, it might be really soul satisfying. When I was a kid we would go to the grocery store and next door there was a drug store. My brother and I would each be given a quarter and set loose in the candy aisle of the drug store while the folks shopped next door. I loved the Jolly Rancher sticks. Remember those? They were about and inch wide and about six inches long. Not those small little candies they make now. You could peel the wrapper back and eat them like a lollipop or a popsicle. Or you could break off a piece about two inches long and put that in your mouth. Once it was good and soft, you could press it on the roof of your mouth and it would stay there for a very long time. I would pretend that it was a retainer, because I thought the cool kids all wore retainers (when I got one, I learned that they were not nearly as cool as sour apple candy pasted to the roof of your mouth). I also loved the Watermelon Now and Later (eat some now, save some for later!). They were sweet and sour and really chewy. That describes perfectly the year that has just passed for me: sweet and sour and really chewy. Many happy times and many trying times, and certainly lots to think about. New Year’s resolutions are for me, a cocktail for disaster. They soon turn into brickbats with which to berate myself. So, I am going to follow my own words which I often tell Angus: Show me, don’t tell me. And in that spirit, we have the first two finished objects of 2006. 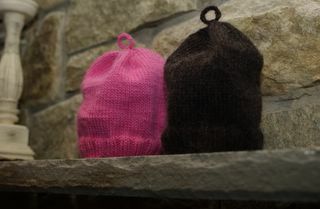 The Laura (pink) and the Niketa (charcoal). Photographed with the flash to afford you an extra special visual experience. 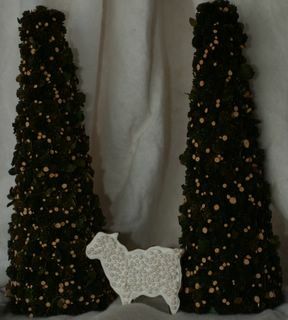 Both are Lamb’s Pride Worsted and follow the same basic pattern as the Carla and the Miss Ali. Fun, easy and done! I do love the little I-cord loop at the top. Makes it easy to hang on a coat hook in the classroom. 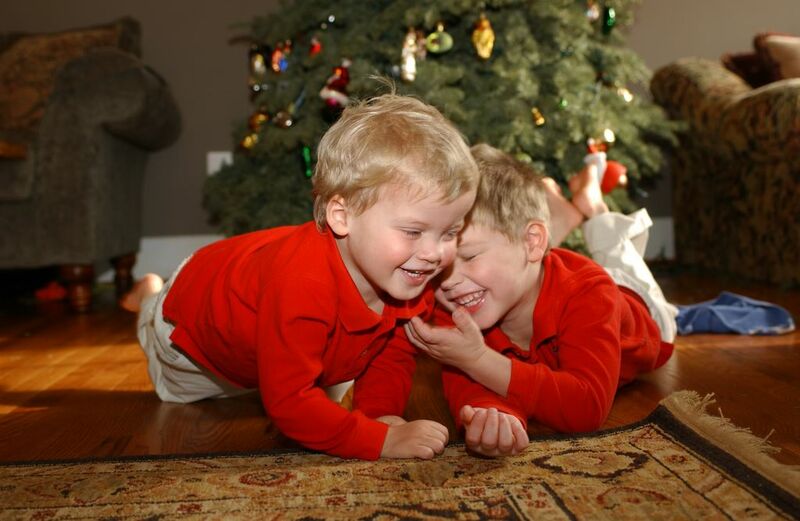 Christmas was very low key- the boys and I were sick. The little one- Bronchitis, the big one, well- lots of um, congestion. Me, major head cold, ugh. But Santa came, games were played, books read and a bit of knitting. I still feel like I am trying to pick myself up off the floor. Getting things in order here. Time to take a critical look at the UFO’s and projects to make. The list is long and daunting. I may retool the way I work projects. So, here I am thinking not of resolutions but of shifting focus. Socks, more kid knitting and more knitting for myself. Just thinking. Sorry for such a content free post- Frog & Tink have awakened me the past two mornings at 4am, with no return to sleep for me. And the boys are a bit stir crazy. Christmas break is alot like snow days- the vision of familial togetherness and sweetness can be intoxicatingly lovely. Then the reality can be quite another thing all together. Merry Christmas and Happy Holidays to all my knitting friends. And may Fleece Prevail on Earth. The time has come to decide what to do. This is my oldest living UFO. Alice Starmore’s Celtic Circles. And because the behemoth is red with 2 shades of orange it is almost impossible to get color accuracy. So just pay attention to the knitting, not the colors. Sunglasses might help. I began this sweater 15 years ago. I have known this sweater almost twice as long as I have known my husband. I was just out on my own. It was the 20th Century. I lived on the West Coast. They still made the yarn that I used in this sweater. I had never knit a steek. I had never knit in the round. I had never done a 3 color ribbing. I have knit about 10 inches up the armhole steeks. I do not have enough yarn to finish the body, let alone the arms. I do not even have a ball band for any of the yarns used but I think it is a pretty safe assumption that they are discontinued. Or do I just knit the sleeves in a solid color that is complementary to the body? Or stripes? Or totally different colors? Ack! Would I actually wear it if I did finish it? I have wanted to frog this off and on for years. I have wanted to finish it off and on for years. The one thing for certain is that I hate looking at it as it is. When I think of frogging it, I get a lump in my throat. I also imagine it could give me a great deal of pleasure to have this particular monkey off my back. 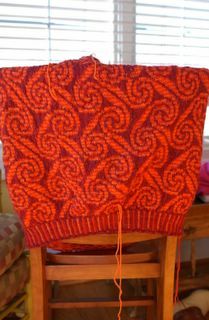 Do unfinished projects interfere with knitting mojo? Might it be advantageous to frog the whole thing as we approach Christmas and the new year? 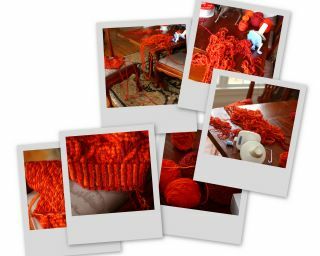 Clearing the knitting slate? Rebirth? ps: I have tried several times to upload pictures of the steeks, inside and amount of yarn left. Imagine if you will perfect steeks, impeccable innards and less than one whole ball of yarn for the 3 colors. Moving is a funny thing. 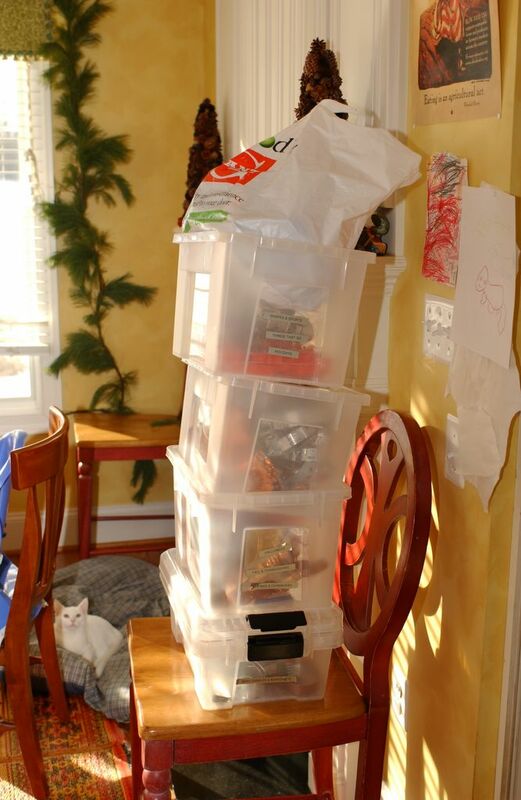 We moved from Seattle 18 months ago with 2 small hollering boys (who, of course were smaller and more hollering back then), a large dog and several truckloads of stuff. There were all sorts of trials and tribulations. The hubbalicious moved out here a month before we did, the boys and I moved into an apartment for that month while we packed & sent our stuff away (including my car), got the house ready for sale and waited for the escrow on our new house to close. Flew cross country and into a new life. Where is the grocery store? How do I find a doctor? Ick, I HATE this grocery store, I miss my old one. (Larry’s) Then have 8 kajillion play dates trying to have the boys make friends and trying to make a few myself. You know, a new routine, a new weather pattern, new yarn stores, new well, everything. It has been wonderful, and hard, and frustrating and a challenge. Who do I want to be in this new place? Did I like who I was in the old place? Why do people smoke and talk on cell phones while pumping gas here? Why is everybody calling me ma’am, or Mrs.? He went on to tell me more of his frustrations for the people of the Gulf Coast, and I got tears in my eyes. All I could tell him was how sorry I was for him and his family and that so many people were so embarrassed and ashamed how the Gulf Coast was treated. This man was still shellshocked but happy, positive and gracious. And everything he has is gone. No work, no job, no computer, no back up files. Nothing. And I complain about being in a new place, of my own free will, that has every ammenity one could ever wish for. My family is safe, my home is a safe, warm, inhabitable place. My fridge is stocked and the present are wrapped. I tell you, that man had more of the spirit of Christmas, love and forgiveness in his little pinky that I may ever see. I think he may have been my Christmas gift, teaching me about gratitude, sacrifice and the spirit of the Holidays. This is a gift I want to keep. Okay. It is true. I have a few cookie cutters. This column is most, but not all of my cookie cutters. Also not seen in this display are cake pans, candy molds and other various forms you can shove food stuffs into. Here are the ones I pulled out yesterday for the Christmas baking. Today was the boy’s Christmas/Peace/Winter party at school. It was really fun and sweet. 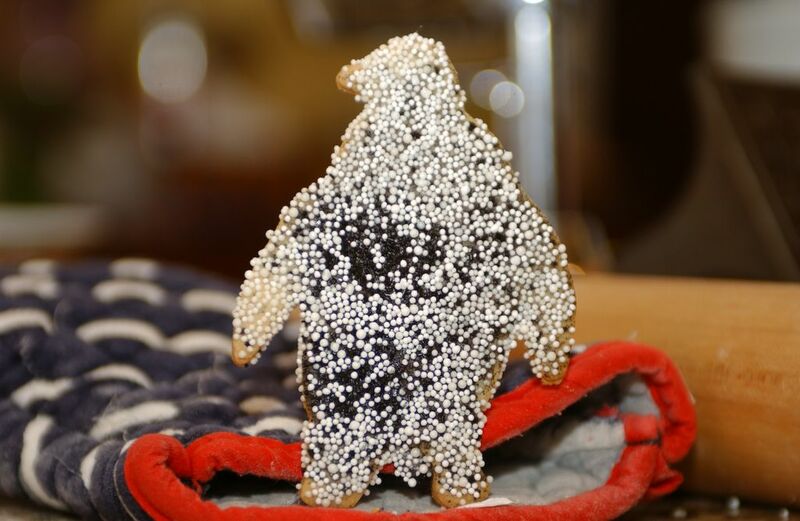 I made penguin cookies for the Toddler room. Fitting because it is about 20 degrees here. I have made another hat, The Mrs. Ali, and it leapt into the wrapping paper so fast I couldn’t even get a picture. But it is The Carla, done in Amethyst. Two down, two to go. The tree is up, but not decorated. Cookie Dough is made for our Cookie Decorating Extravaganza this afternoon. Packages have been mailed, lots of firewood procured, groceries ordered and the house is decorated. And I am looking forward to lighting a fire in the fireplace, picking up some knitting and hanging out with my family. Oh yea- and for all these years of knitting, I have NEVER made a pair of socks. I think it is high time. I have the books, I have the needles and I just might need some sock yarn. Hmmm- more yarn. Tomorrow, I will show you the tree. Finished and gifted this hat to Angus’ teacher Carla yesterday. It is one WARM hat, which is perfect because she is one COLD lady. It was perfect, I showed up at school just as she was getting ready to take the kids outside to play. It was a great knitter moment. I handed her the package and said: “If you are going outside, you need this.” When she saw the hat she said: “Now, THAT’S my color!” Then she put on the hat and wore it outdoors. It fits her perfectly, looks great and is super warm. Also, she is easy to spot because this hat is really red! 1. No stripes. Why? 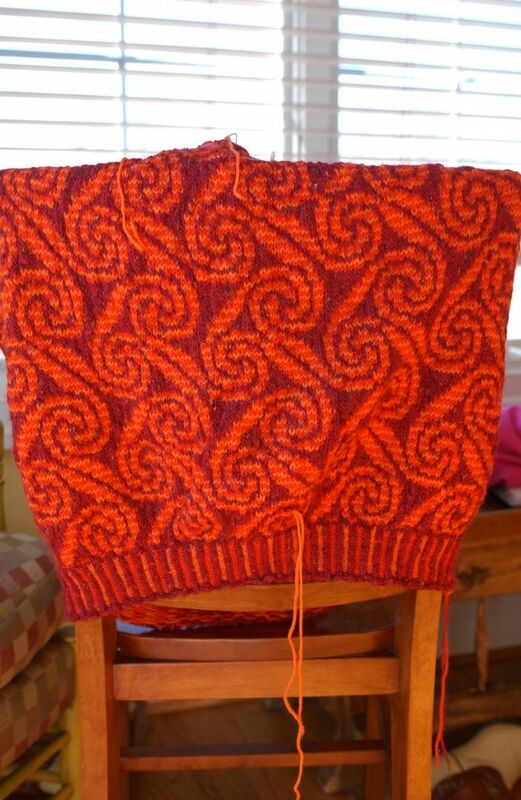 This was a stash-busting exercise and this red went horribly with the other reds in the stash. Put it next to a tomato red and it looks pink and the tomato looks brown. Not what I was after. 2. I made the ribbing about 5 inches long, and then knit the first section of the hat the same length. 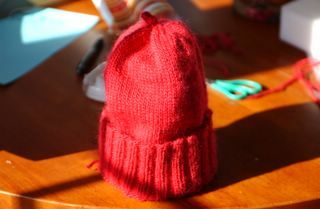 Then entire ribbing is meant to be turned up and the fold line is designed to be at the bottom of the ears. Like a hat and a ear warmer/headband all in one. It is a very snug fit. 3. It is shorter, obviously. I wanted her to have it now and didn’t think the length would add warmth. For the record, it took about 3/4 of a skein of the Lamb’s Pride. It was super-quick and really gratifying. I forgot how much I love Lamb’s Pride. I have more in the stash and think Duncan’s teacher and her assistant as well as Carla’s assistant might need a hat too. So, yea it is just a hat. But a really great hat that warms her head and my heart.